Join the LM&M Railroad for a family friendly adventure. You will travel on a historic train between Lebanon, OH and Hageman Junction. During your ride you can listen to our informative passenger conductors describe railroad history and operations. Each ticket includes a serving of pizza and a 12-ounce can of soda or bottle of water. Additional drinks and snacks will be available for purchase on board the train from our concession stand. Deluxe Coach class seating will be inside the Milwaukee Road 3200 car. This long distance coach car was featured in the 2015 movie Carol. The 3200 seats 60 passenger. The car features comfortable reclining chairs, and large picture windows. Seats in deluxe class are reserved.The 3200 car is heated and air conditioned. 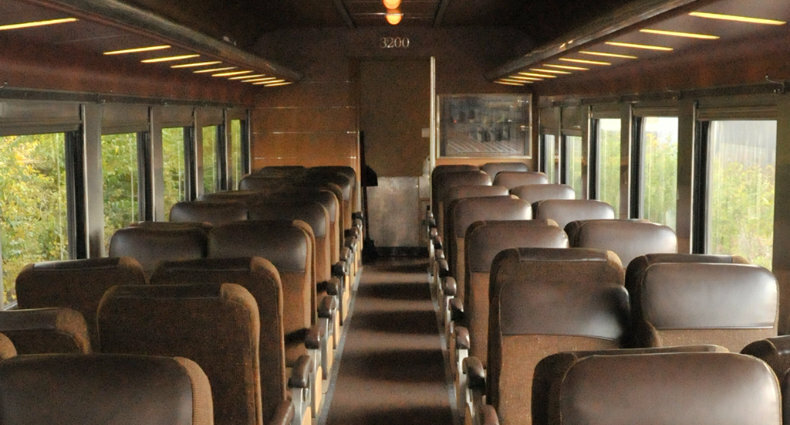 Coach passengers will be seated in our 1930’s restored Lackawanna coach cars. Our Lackawanna coach cars feature traditional railroad “walk-over” style seating. This allows families or groups of 4 to face each other. Coach seats are reserved. Our Lackawanna coach cars are heated and feature open windows. Fans circulate air on warmer days. We must charge a minimal ticketing fee in order to provide our customers an efficient and trustworthy ticketing system. Online Orders: $1.50 per ticket. Phone Orders: $2.00 per ticket. We offer group discounts for groups of 10 or more! Check out our group discount breakdown below. Please contact the ticket office prior to purchasing your tickets in order to use this discount as it is not offered for online orders. Please be sure to dress for the weather! In the event of inclement weather, we recommend that our guests wear appropriate clothing such as boots and jackets. All trains run rain or shine. Cancellations due to weather will only be made by the LM&M Railroad in extreme circumstances. *Please Note* Due to the historic nature of our equipment, the LM&M Railroad is not handicapped accessible. The LM&M Railroad reserves the right to change equipment or cancel an event/train ride at any time for any reason it deems necessary. Prices are subject to change without notification. All tickets purchased are subject to additional fees. The LM&M Railroad strictly enforces a no refund policy. This trip will not be handicap accessible. Historic and antiquated rail passenger equipment, like that used on this excursion, is exempt from ADA regulations under U.S. Code: Title 42: Section 12184. The passenger cars and station facilities used on this excursion were constructed before disability accessibility laws were adopted. Platforms, boarding areas, stairs, step-boxes, seating, and especially doorways, passageways, aisles, and onboard restrooms may not accommodate all passengers. We will make all reasonable efforts to accommodate differently abled passengers who desire to ride the train. Motorized wheelchairs and/or scooters cannot be accommodated onboard our train. The LM&M Railroad is not responsible for unsafe footing on property owned by third party organizations or created by situations beyond our control. Please watch your footing while loading and unloading from the train.